Blair R. Kipnis is an Associate Attorney who focuses his practice in civil litigation, with an emphasis on medical liability defense. Mr. Kipnis has dedicated his practice to defending health care providers of all types against claims of medical negligence. He has successfully represented hospitals, nursing homes, medical groups, and physicians in numerous cases, many of which have resulted in summary judgment or dismissal for his clients. Mr. Kipnis also has extensive experience representing clients before the Illinois Workers’ Compensation Commission. Mr. Kipnis is a graduate of the University of Michigan in Ann Arbor, Michigan where he double majored in Economics and Philosophy and earned University Honors and the James B. Angell Scholar Award. He received his law degree from Loyola University Chicago, where he received dean’s list honors and the CALI Award for Excellence in Advocacy. He was also a member of the Loyola Consumer Law Review and the Federal Tax Clinic. 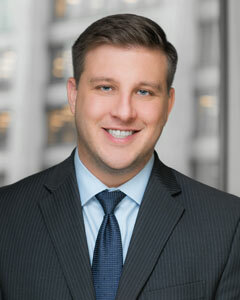 During law school, Mr. Kipnis gained valuable experience clerking for a prominent tax litigation firm as well as serving as a judicial intern for Circuit Court Judge James R. Epstein.